The strongest & fastest tool to rip any DVDs to any digital videos for playback in Mac, any mobiles: DVD to MP4, H.264, AVI, WMV, iPhone, iPad, Android, etc. 350+ ready-profiles. Sharing to get! Only 1 step>> or Buying it on discount price. ● Ultimate video converter/downloader, screen recoder, slideshow maker. 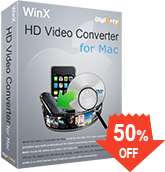 ● Convert any SD/HD video on Mac to any format and mobile phones. ● Download video from 300+ sites, like YouTube, Facebook, etc. Rip DVDs to any video formats for playback on Mac or iPhone iPad. Transfer iOS files between iDevice and Mac. Manage iPhones/ringtones. Download online video & music; convert any videos to any formats and mobiles. MKV, AVCHD (MTS, M2TS), MOD, TOD, TS, AVI, YouTube video, WMV, MPEG, MP4, H.264, MOV, VOB, 3GP, WebM, VPX8, etc. MP4, H.265, H.264, MKV, iTunes, MOV, FLV, MPEG, AVI, WMV, QT, iPhone, iPad, iPod, Apple TV, Android, WP8, etc. Download videos from 300+ sites, e.g. YouTube, Facebook. Make slideshow. Record screen. Manage iOS file, transfer music, video, images, iBook, ringtone, etc., mount iDevice as USB. Gift: 5KPlayer - All-in-one free HD video/music player, DVD player and AirPlay media streamer. 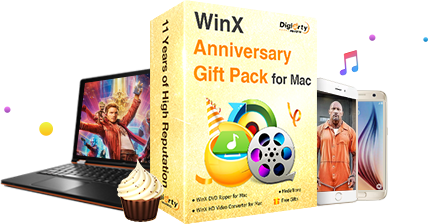 Buy WinX DVD Ripper for Mac Lifetime License NowHere we offer 55% off discount to you. Hurry, time-limited.